Adam Kujath, Site Director at Alcami’s API manufacturing and development facility in Germantown, Wisconsin, recently spoke about the business challenges clients face, and the circumstances that led to the successful resolution of this customer’s issues. In this second part of the series, Kujath addresses supply chain management and strategies involving the API process. 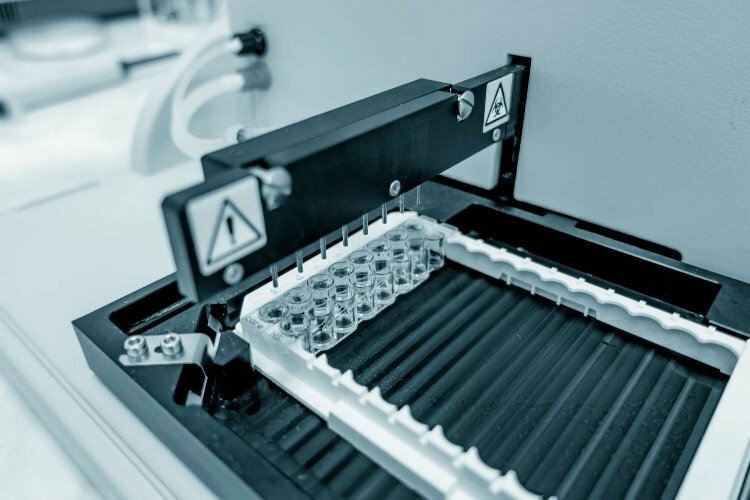 To recap, when an innovative New England-based biotech company needed a fresh batch of Active Pharmaceutical Ingredients (API) for a quickly approaching clinical trial, they turned to Alcami.The neuroscience pioneer company previously partnered with Alcami and the proposed work would help secure their next round of financing. The biotech company utilized other vendors for formulation, solid-state and analytical services, believing they had their process under control. They later realized a fragmented supply chain and non-integrated control strategy led to a six month delay, requiring a repeat of their clinical study. 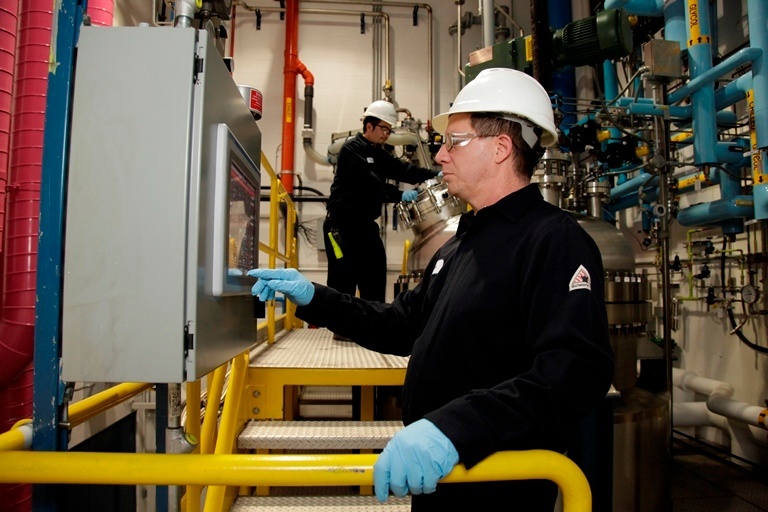 The company relied on Alcami next for rapid and robust API manufacturing support. I joined Alcami in May 2015. I am a Process Engineer II in the manufacturing technology group and a development work cell lead at Alcami's Germantown, Wisconsin site. The most rewarding part of my job is working with R&D and operations to manufacture a high quality product for our clients. 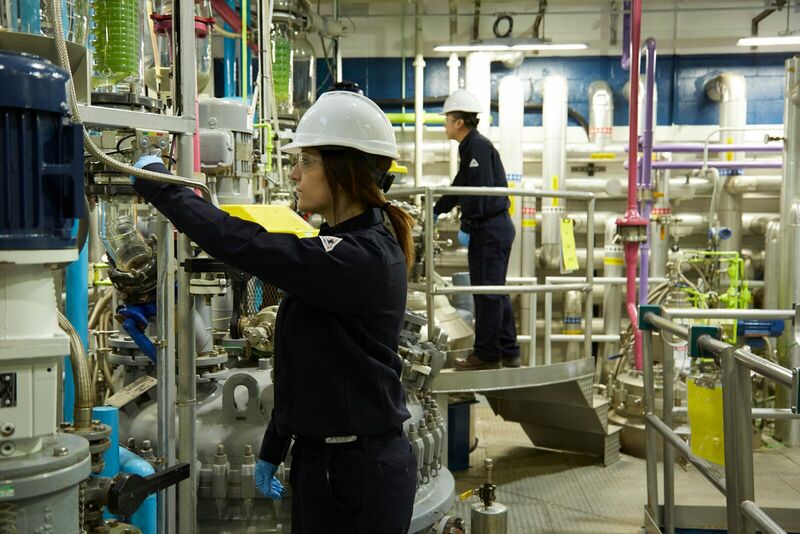 I get to engage with R&D to develop a robust process for the plant, and then support operations during manufacture. I strive to enhance the skills of others to provide the necessary efficiency to meet client and site manufacturing expectations. 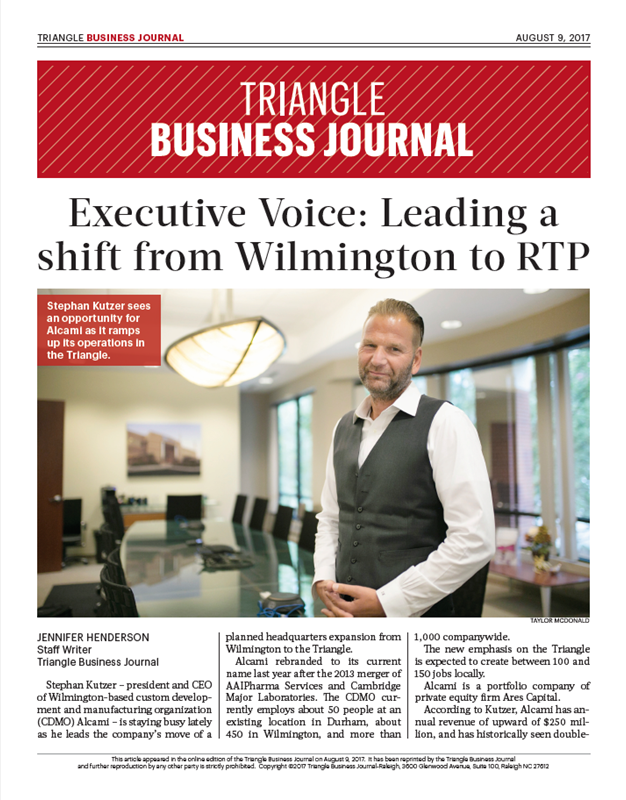 Dr. Stephan Kutzer, CEO, President and Chairman of Alcami Corporation, sits down with the Triangle Business Journal to discuss the transition of Alcami's global headquarters to Research Triangle Park (RTP). From a business strategy perspective, why did Alcami decide to move its planned headquarters expansion from Wilmington to Durham? Our Wilmington operation is an instrumental part of our service offering. Over the last three years, we have invested heavily in new laboratory and manufacturing capacities, and the site enjoys an excellent reputation with the regulatory authorities and our clients. As we continue to grow and expand into new technology platforms, for example HPAPI (highly potent active pharmaceutical ingredients), controlled substances and biologics, we learned that this expansion has to happen in a pharmaceutical hub. 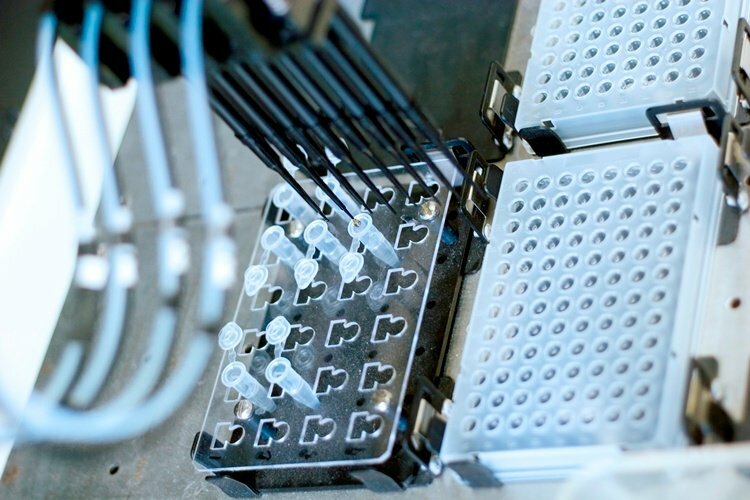 When an innovative New England-based biotech company needed a fresh batch of Active Pharmaceutical Ingredients (API) for a quickly approaching clinical trial, they turned to Alcami. The neuroscience pioneer company previously partnered with Alcami and the proposed work would help secure their next round of financing. The biotech company utilized other vendors for formulation, solid-state and analytical services, believing they had their process under control. They later realized a fragmented supply chain and non-integrated control strategy led to a six month delay, requiring a repeat of their clinical study. The company relied on Alcami next for rapid and robust API manufacturing support. Adam Kujath, Site Director at Alcami’s API manufacturing and development facility in Germantown, Wisconsin, recently spoke about the business challenges clients face, and the circumstances that led to the successful resolution of this customer’s issues. When your company decides to explore options to develop your drug product, there are endless possibilities. However, this excitement is often quickly followed by a daunting list of possible avenues to go from clinical to commercial. The vision that allowed you to get this far has been realized, but now you face an entirely new challenge. 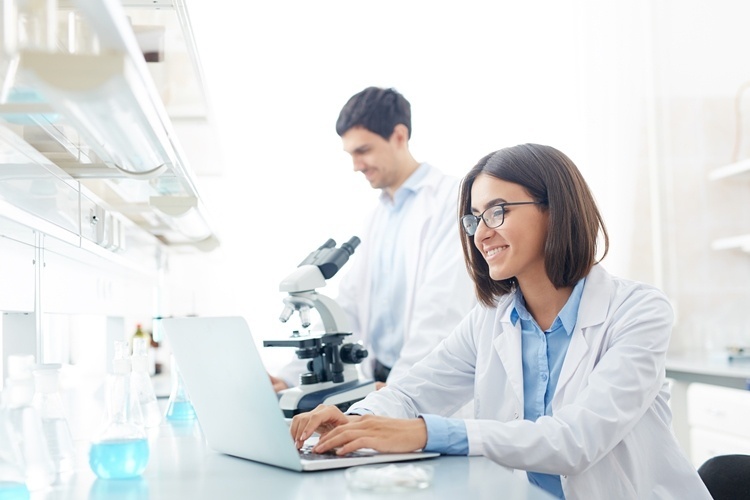 You must decide between an integrated or a non-integrated drug development approach, determining whether to use multiple vendors for the API, solid state development on API, drug product and analytical services. Which approach will be the fastest, most cost-effective and ulitmaley reduce risk? With each choice, you must be weigh your priorities and adjust your risk tolerance. 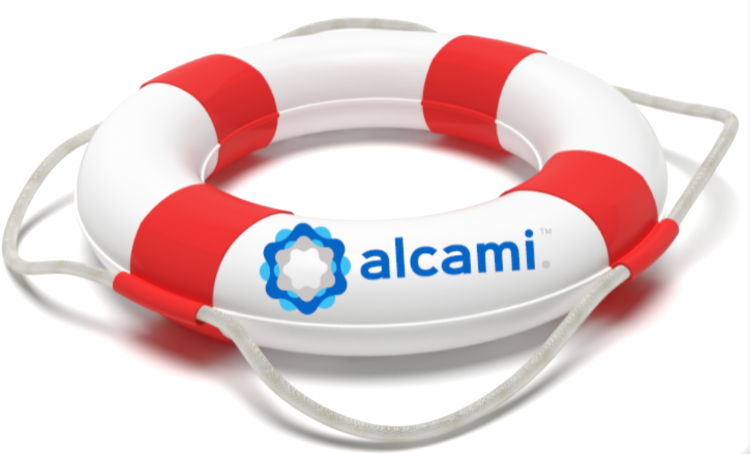 Join Alcami for a webinar to learn more about the future state of supply chain solutions. From quality issues and drug shortages, to warning letters and natural disasters, today’s risks are significant and supply disruptions can be catastrophic. Therefore, having a secondary supply chain “on-call” is a must. When developing this innovative dual sourcing strategy, validation of processes with a reliable and flexible supplier protects against supply interruption. Alcami has designed Protect Your Brand™, a first-to-market initiative, to aid in the protection of supply chains. 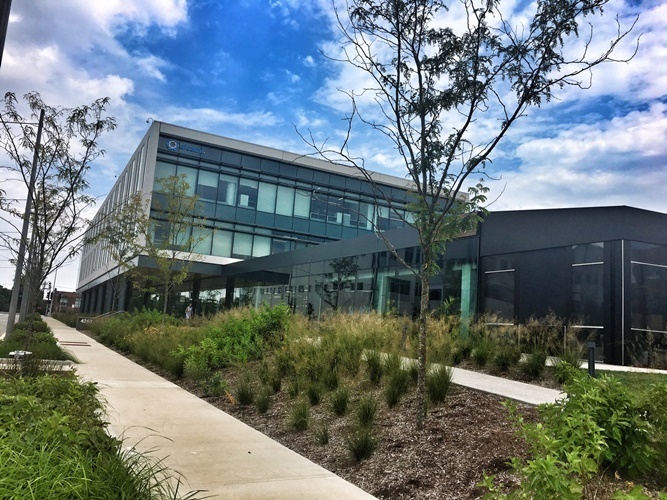 Join Alcami for an open house at our brand new St. Louis, Missouri site, located in the Cortex Innovation Community- the Midwest’s leading center for bioscience and technology research, development and commercialization. The event will include tours of our new state-of-the-art facilities, a site overview presentation, and Q&A lunch with members of our leadership team.